WATCH Do Marriage and Children Make a Better Governor? Women are poised to make history in Oklahoma next week, when the state will elect its first female governor. And in the final stretch of the campaign between Democratic Lt. Gov. 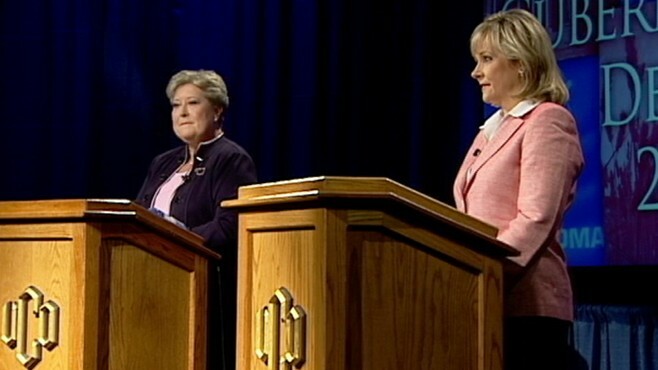 Jari Askins and Republican U.S. Rep. Mary Fallin, the experience of motherhood has emerged as a contentious debating point. "You know, in Oklahoma, all of our governors have been men. So none of them have been mothers," she said on "Good Morning America" Tuesday. "I think most of them have done a pretty good job – so I don't think that's a criteria." Fallin's effort to highlight the distinction of marriage and motherhood late in the race has raised questions about the relevance of that experience for holding the state's top office. "I imagine that her comments came from – her political consultants had suggested that she bring that up," said Askins. "I still stand on my record of public service for twenty-something years and believe that's what the voters are going to make their decision based upon." Fallin has defended the emphasis on her experience as a wife and mother as giving her "good perspective" on what average Oklahomans face. "If I am asked what 'defines' me, either as a candidate or as a person, I can't ignore being a mother or being a wife any more than I could my gender, my Christian faith, my conservative values, or my experience in both the private and public sector," she said in a statement. Experts say the issues of marriage and motherhood have a reasonable place in policy debates but that gender differences -- not marital status or parenting experience -- typically shape a candidate's responsiveness or sensitivity to issues surrounding families and children. Christine Sierra, a political scientist at the University of New Mexico who studies the role of women in politics, said it's not uncommon for women who are not mothers to be in politics – noting there are even more single women in political office than men. "The single woman is actually not that atypical among women generally who seek public office because of the obstacles associated with raising a family," she said. Several prominent political figures have cited single-relationship status and lack of children as advantageous for women who are focused on a career in politics and government service. In 2008, Pennsylvania Gov. Ed Rendell praised then-Arizona Gov. Janet Napolitano as a candidate for Secretary of Homeland Security "because for that job, you have to have no life. Janet has no family. Perfect. She can devote, literally, 19, 20 hours a day to it." Supreme Court Justices Sonia Sotomayor and Elena Kagan and former Secretary of State Condoleeza Rice are other recent examples of prominent women in public service who are not married and do not have children. Delaware Republican U.S. Senate candidate Christine O'Donnell has also never been married. But several successful female politicians have juggled both motherhood and their responsibilities for office. New York Sen. Kirsten Gillibrand, for example, has two young children and gave birth to her youngest in 2008. Former Kansas governor and current Health and Human Services Secretary Kathleen Sebelius raised two sons while holding state office. "We have wonderful examples of women in this country who have served not just in Oklahoma, but across the United States, who have been mothers and those, like Condoleeza Rice and others, who have not been able to claim that," Askins said. "So it's not an issue." Still, in Oklahoma, conservative values, including the role of women in marrying and raising a family, remain popular, Sierra said. The Center for American Women in Politics at Rutgers University ranks Oklahoma 49th among the 50 states for percentage of women in the state legislature, with just 17 women out of 149 members. Only South Carolina ranks lower.